and tilt tension control. 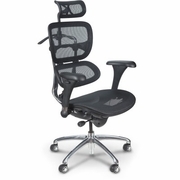 Contoured to provide optimum and natural lumbar support. and height adjusts from 18" to 21" on a smooth pneumatic cylinder. correct neck support whether upright or reclining.